I finally got everything I needed to make these pendants that I've been wanting to make for a while. They are made from cutting down blank microscope slides, putting whatever image you want between them, sealing it with copper foil tape, then soldering it. I add little embelishments to mine. 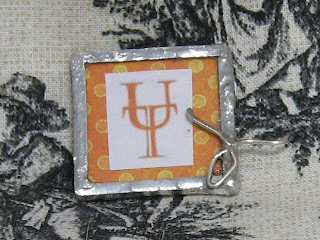 The first pendant seen here is a good ol' University of Texas pendant that I made with scrapbook paper and orange font on photo shop (no licensed images here--my OWN doing). I tinkered with some wire until I figured out that I could make a little longhorn to embelish it with. I think he's cute!! I'll work on one for the Aggies next. I am neutral in that fight. 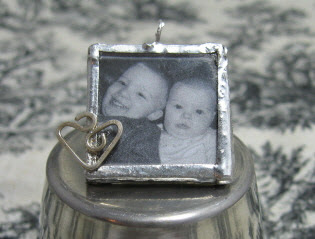 This second one is my precious angel babies......do you know how hard it is to get two babies in a picture together? I haven't had another one of BOTH of them together since Chelsea was still in slug status.